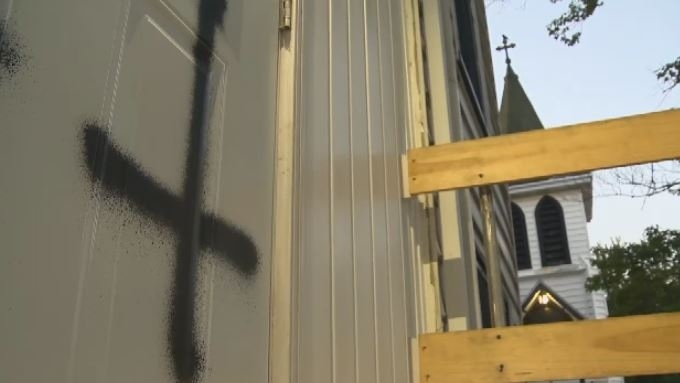 Halifax Regional Police are investigating another graffiti incident in Dartmouth after upside-down crosses were spray-painted on a church. Police were called to the SonLife Community Church on Windmill Road shortly after midnight Monday. When officers arrived, they found large, upside-down crosses spray-painted on two doors. The incident follows other acts of vandalism in Dartmouth in recent days. Swastikas and other offensive symbols appeared on the band shell and on benches at Sullivan’s Pond, as well as on Saint Peter’s Catholic Church and Prince Andrew High School, over the weekend. Investigators are trying to determine whether the incident at SonLife Community Church is related to the other incidents in Dartmouth. Police say whoever is responsible for the graffiti could face mischief charges, as well as charges for mischief over $5,000, depending on the total cost of the cleanup. Anyone with information about the vandalism is asked to contact Halifax Regional Police. Police are investigating vandalism at the SonLife Community Church in Dartmouth. Municipal workers clean spray painted swastikas off of Saint Peter's Catholic Church in Dartmouth Sunday morning.